This year’s symposium took place – as usual – in the Robert Emmet Theater in the Arts Building, Trinity College Dublin, and provided a wealth of new information on medieval Dublin. 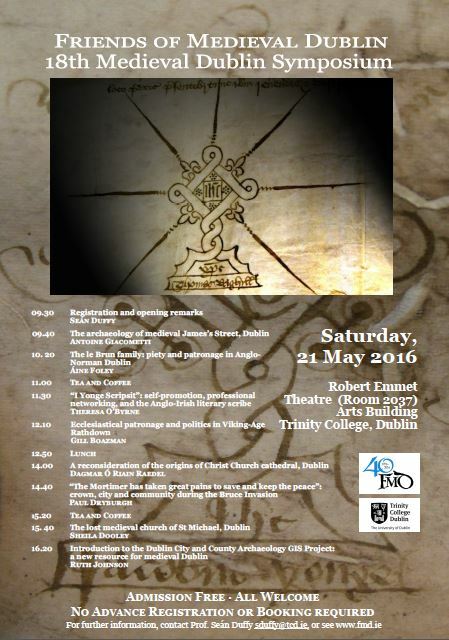 Theresa O’Byrne examined the promotion and networks of the fifteenth-century Dublin notary and writer James Yonge, after which Gill Boazman outlined the ecclesiastical patronage and politics evident in Viking-Age Rathdown. After lunch Dagmar Ó Riain Raedel presented findings on a reconsideration of the origins of Dublin’s Christ Church cathedral and Paul Dryburgh explored Lord Lieutenant Rodger Mortimer’s civic actions in Dublin during the Bruce invasion. Sheila Dooley’s paper will allowed us to rediscover the lost medieval church of St Michael and city archaeologist Ruth Johnson concluded the symposium with a presentation on an important new resource for medieval Dublin by offering an overview to the Dublin City and County Archaeology GIS Project stretching all over the city and county of Dublin.